You don't have to attend an aqua aerobics class in order to enjoy the many benefits of exercising in the pool. Get in the water and enjoy a fun, low-impact workout that will build strength and endurance. Tired of the gym? Many pools offer floating free weights specific to aquatic exercise. They are large and buoyant and can provide good resistance in the water to build strength and shape muscles. Grab two dumbbells and head into the pool's shallow end. You'll want to be at least waist deep, but not submerged deeper than the chest. Start with the feet, standing hip width apart. Dumbbell Curls: Begin with both dumbbells by the hips. Alternate by lifting one side, bending at the elbow and curling the dumbbell up toward your shoulder. You should feel this mostly in your bicep. Repeat on each side 10 to 15 times. Triceps Push: With both dumbbells at hip level, with straight arms, push the hands back until you feel enough resistance, then return to hip level. Repeat 10 to 15 times. Shoulder Strengthener: With both arms spread out to each side, palms facing down, bring both arms together in front of your body, palms still facing down. Then push the weights into the water and alongside the hips. Lift the arms back up to shoulder height and repeat. Repeat 10 to 15 times. Total Arm Toner: Beginning with dumbbells at hip level, make small circles in one direction gradually bringing the arms up to shoulder height. Reverse circle direction as you lower the arms back to hip level. Repeat 10 to 15 times. Chest, Back and Arms: Use the wall as a prop. Face the pool edge. Bring hands to the wall at chest level. Back the legs up so you are at a diagonal. Bend the elbows out to the side and bring your chest closer to the wall keeping a flat back. This is a wall push up. Change up the resistance by adjusting your legs. Closer to the wall is easier, farther away from the wall is more difficult. You can also adjust your hand position. Bringing the arms wider out will work your chest muscles and arm muscles differently. Experiment with bringing hands farther and closer apart. Repeat 10 to 15 times in each position. Shoulders, Arms and Back: Facing the wall, place your hands out of the water on top of the edge of the pool so the palms are facing down. Bend the knees and hop out of the water, using your arms to boost you up as high as you can go. Land slowly back on your feet, bending your knees and come back to a standing position. Repeat 10 times. Back and Shoulders: You can do pull ups in the pool by facing the wall and putting your hands on the edge of the pool. Bend the knees and sink down into the water as deep as you can bend, then using the arms, pull yourself as high out of the water as you can. Repeat 10 to 15 times. Start with the basic crunch by floating on your back and drawing your knees in toward your chest. Bring the legs back out straight, then repeat by bringing the knees back into the chest. Repeat up to 20 times. For an oblique workout, stay in the same floating position, but draw your knees to one side of the body, then back out, and then in on the other side. Repeat each side. Stand next to the wall, keeping one hand on the wall for support. Keep feet slightly wider than hip distance apart, bend the knees. Tilt the pelvis forward, pause, then back to neutral. Tilt the pelvis back, then back to neutral. Repeat in each direction 10 times. For added difficult, remove the hand from the wall and bring the arms out to the sides. Stand with one arm on the pool wall and the other arm stretched out to the side. Draw the leg farthest away from the wall slowly up, taking the knee up to hip height. Pause for a breath, then slowly return the leg to the ground. Repeat on that side 10 to 15 times. Turn around and do the other side. For added difficulty, remove the hand from the wall and keep both arms stretched out to the sides. Bend at the knees into a squat, keeping the knees in line with the ankles. Reach your hips back and keep your chest lifted. Repeat up to 15 times. Move to the pool's edge and grab hold of the wall. Extend one leg up and back, lifting to a comfortable height then lowering back to nearly touch the floor. Repeat each side up to 15 times. Turn around to have your back face the wall, lift both legs and begin a bicycle action for 1 minute. Draw one knee up and circle it across the body then lower the foot to the ground. Switch sides and repeat for up to 20 reps. Jog in place 1 minute, lifting the knees as high as they will go. Leg crosses: Stand with feet farther than hip distance apart. Jump up and cross the feet, landing with one foot over the other. Jump back out, then jump in again, crossing the feet again, bringing whichever foot was forward the first time to the back this time. Repeat this for 1 minute. Tread water: Move to deep enough water that it is difficult or impossible to touch without dipping your head below the surface. Tread water without dipping the head for 1 minute. Leg kicks: With the back facing the wall, hold on to the side of the pool and bring the legs up to hip distance. Bicycle the legs at a quick pace for 1 minute. Jump and squat. With feet hip distance apart, bend the knees and draw the hips back and bring the arms straight down. Pop up and jump out of the water as high as you can, lifting your arms over your head. As you land, return to a squat position. Repeat for 1 minute. Combine any of these workouts for a full-body conditioning experience in the pool. You might want to start off slow and build up over time. You can decrease or increase reps, and also increase the time of a cardio interval. Begin with five minutes of warm ups by gently jogging in place or walking from one end of the pool to the other. Bring feet hip width apart and do 15 squats, holding weights in the hands if you have them and keeping the arms at chest height. Alternate kicks to the side with each leg, 10 on each side. Jog in place 1 minute. Move to the wall and face the wall. Practice 10 wall pushups. Place hands on the pool deck and pop up out of the water 10 times. Turn the back to the wall, still holding on to the wall. Bring legs to hip level and bicycle the legs at a rapid pace for 1 minute. Turn around and do 10 more wall pushups with arms spread wider than they were before. Take one arm away from the wall and turn 90 degrees. Bring the knee up to hip height and lower to the ground. Repeat 10 times. Turn around and do the other side. Jump and squat for 1 minute. Float on your back, bring your knees in to your chest, then straighten the legs. Repeat 10 times. For the obliques, stay on your back and draw your knees to one side, then the other. Repeat each side 10 times. 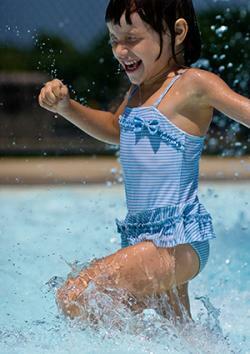 Cool down by walking the pool for 5 to 10 minutes. Modify this workout by combining any or all of the above moves into a routine that is as long as you need it to be. Make sure to add at least one exercise from each grouping to get a full-body workout that also includes cardio exercises. Doing these exercises in the water will help you meet your fitness goals while having lots of fun. Remember to always check with your doctor before undertaking an exercise program.